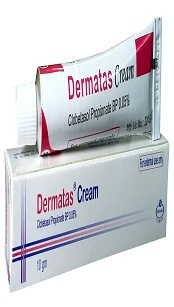 Clobetasol Propionate is a highly potent topical steroid. It has both local anti-inflammatory and immuno suppressive activity. Clobetasol, as the propionate salt, is only used topically on the skin and its eflects ara limited the local anti-inflammatory activily. When given systemically it has standard glucocorticoid activity and binds with high affinity to the glucocorticoid raceptor. Clobetasol Propionate inhibits the adherence of neutrophlls and monocyte-macrophages to the capillary endothelial cells of inflammed area. Clobetasol blocks the eflacts of macrophage migration inhibitory factor and decreases the activation of plasminogen to plasmin. 1. Initial control of all forms of hyper acute eczema in all age groupa ( in childran for longer than a few days). 2. Chronic hyperkeratotic eczema of all hands and feet and patches of chronic lichen simplex. 3. Chronic hyperkeratotic psoriasis of any area of the body. Apply sparingly to the affected area once or twice daily until improvement occurs. As with other highly active topical steroid praparatlons, therapy should be discontinued when control is achieved. If longer course is necessary, it is racommanded that treatment should not be continued for more than four weeks without the patients condition being observed. Repeated short course of Dermatas may be used to control exacerbations. If continuous steroid treatmant is necassary a less potent preparation should be uaed. In very resistant lesions, especially where there is hyperkeratosis, the anti-inflammatory effect of Dermatas can be enhanced, if necessary, by occluding the treatment area with polythene film. Only overnight occlusion is usually adequate to bring about a satisfactory response. Thereafter, improvement can usually be maintained by application without occlusion. Provided the weekly dosage is less than 50 gm in adults, any pituitary-adrenal suppression is likely to be transient with a rapid return to normal values once the short course of steroid therapy has ceased. The same applies to childran given proportionate dosage. Use of occlusive dressing increases the absorption of topical corticosteroide. Prolonged and intensive treatment with a highly active corticosteroid preparation may cause atrophic changes, such as thinning, striae and dilatation of the superficial blood vessels, particularly when occlusiva dressing are used or where skin folds are involved. Long term continuous therapy with clobelasol propionate should be avoided, particularly in infants and children, in whom adrenal suppression occurs readily. If Clobetasol propionate is required for use in children, it is racommanded that treatment should be reviewed on weekly basis. It should be noted that the infants napkins may act as occlusion dressing. The face more than other area of the body, may be exhibit atrophic changes after prolonged treatment with potent topical corticoste-roids. This must be borne in mind when treating facial conditions which warrants use of clobetasol propionate and frequent observation of the patient is important.